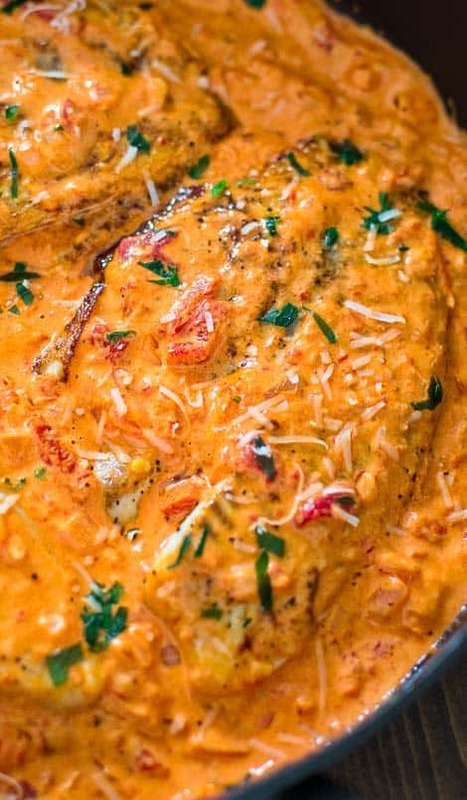 This Tilapia in Roasted Pepper Sauce is absolutely scrumptious, elegant and worthy of a special occasion. You won’t believe how easy it is to make it! 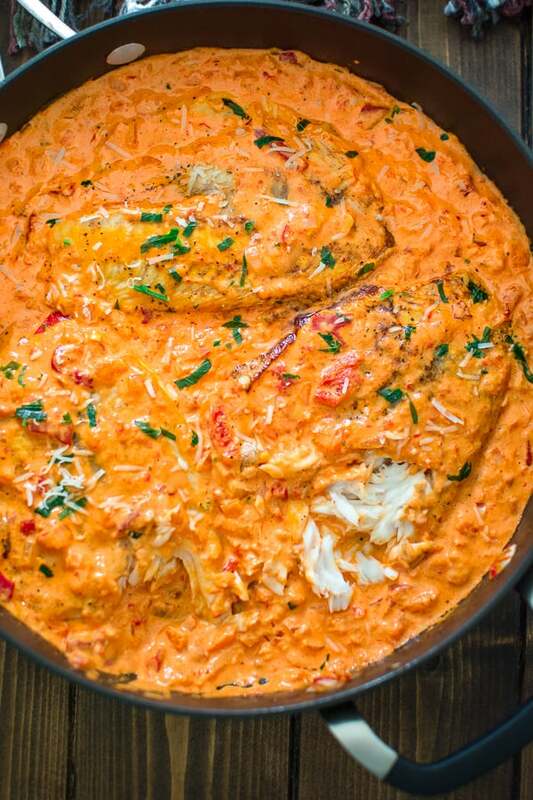 I am really proud to share this tasty Tilapia in Roasted Pepper Sauce recipe with you. I’ve been trying to come up with the perfect roasted pepper sauce and I finally found it! Yay!!! 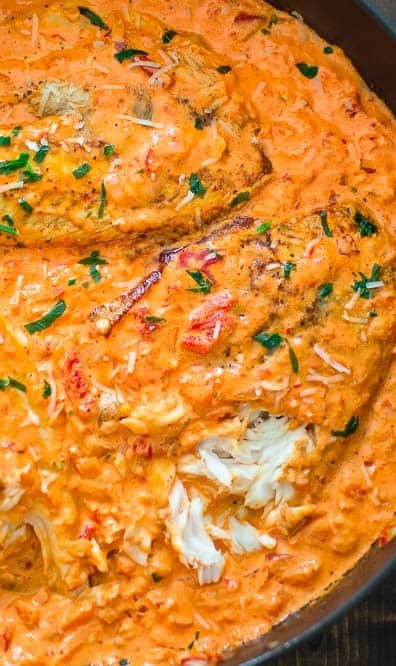 It pairs so well with tender tilapia and I can say, without any hesitation, that this dish makes it into my top 3 most loved recipes. Did I mention that it is super easy to make? Seriously, after you cook this dish, you’ll feel like you are at an expensive restaurant. Don’t forget to pair it with fresh, toasted bread and a glass of your favorite wine. 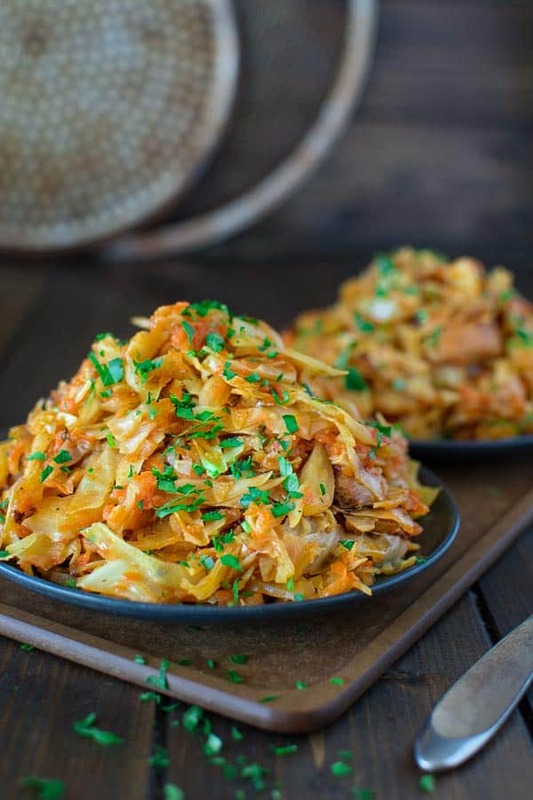 You can also serve it on top of pasta if you’d like to have a more filling meal. I found I like it best with garlic bread. My husband loves dipping the bread into the creamy sauce while sipping his wine. Whatever you choose to serve it with, I guarantee you won’t be disappointed. 1. Melt 2 tbsp. 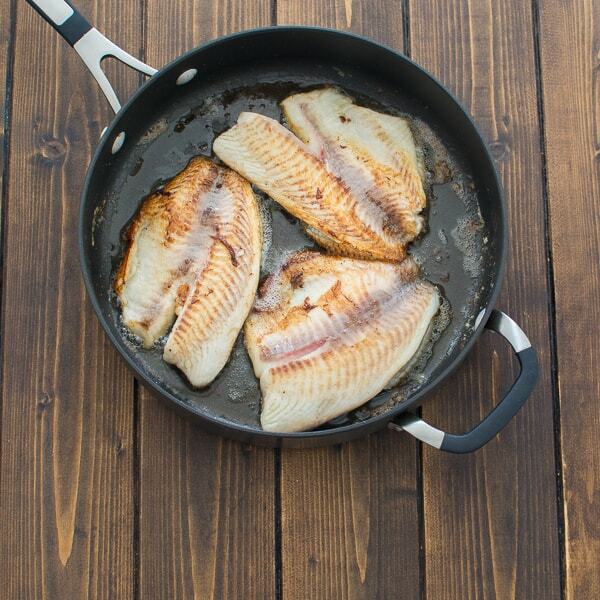 of butter in a large, non-stick skillet and fry the fish for 3-4 minutes on each side, until cooked through. 2. Season the fish with salt and pepper, remove from the skillet, and set aside. In the same pan, add the remaining 1 tbsp. of butter and onion and saute for 5 minutes. 3. Add the garlic and chopped and pureed roasted peppers, then keep cooking for another 5 minutes. 4. Add the heavy cream and Parmesan cheese. Turn off the heat, stir, and taste if the sauce needs more salt. 5. Return the fish to the pan and cover it with sauce. 6. Garnish with chopped parsley and grated Parmesan cheese. 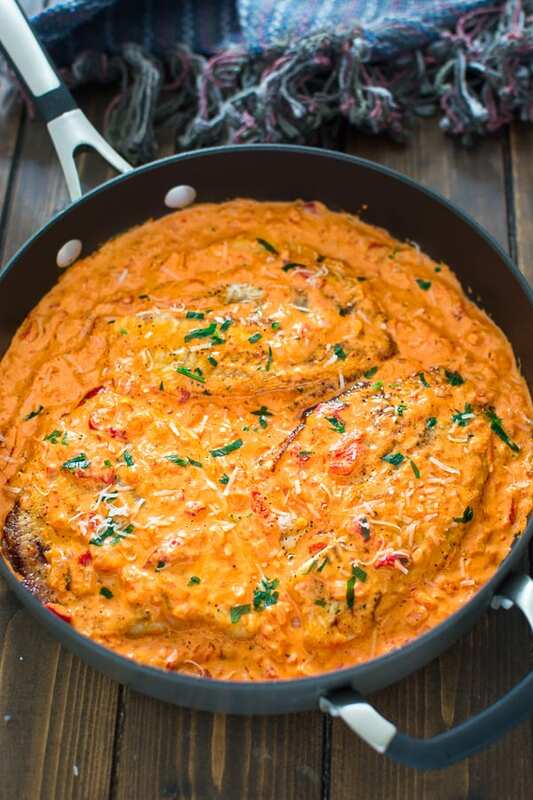 This Tilapia in Roasted Pepper Sauce is absolutely scrumptious, elegant and worthy of a special occasion. You won't believe how easy it is to make it! NOTE: Home-baked and store-bought roasted peppers will work well in this recipe. Oh my goodness!! I could lick my plate! This was so goood .. thank you! I made it as you wrote it, roasted and puréed my own peppers, but did add fresh spinach to wilt on top at the end. The red and green was very pretty. Thanks again! Can just the sauce be frozen ? I drive semi and make meals to freeze and take on the road for the week. This would be an easy meal to “finish ” on the road. Hi Lois! Although I have never froze this sauce before, I think you can freeze it with no problems. Thanks for stopping by! 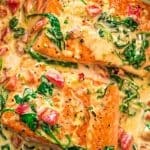 This is my favorite fish recipe. 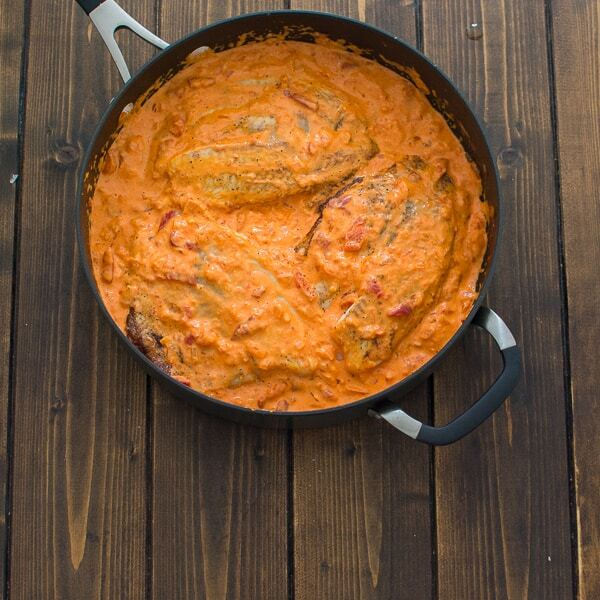 I use this recipe on the trout or snapper that my husband catches on fishing trips. 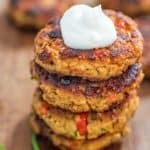 It’s so flavorful and quick and easy to make. It’s definitely a keeper. end result was an awesome dish that didn’t take much time or effort. it will be a regular in my rotation from now on!!! Thanks for the feedback. I bet your sauce was fantastic!!! I made this for dinner tonight. Followed the recipe to the letter and served with bow tie pasta and steamed broccoli. This sauce is fantastic! I roasted my own peppers, as it is simple enough. Everything else came together very quickly. I’ll definitely be making this again. I want to try it with shrimp or chicken next. Wow! I am happy you enjoyed the dish, Amanda! 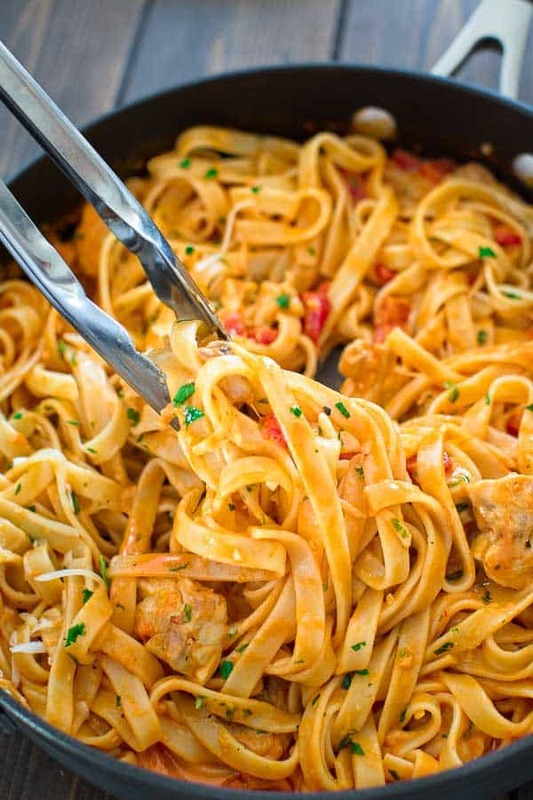 I have tried this sauce with both shrimp and chicken and it was great as well. Thanks for the feedback! The only sounds from the other side of the table were mmmmmm and a fork scraping up the sauce! 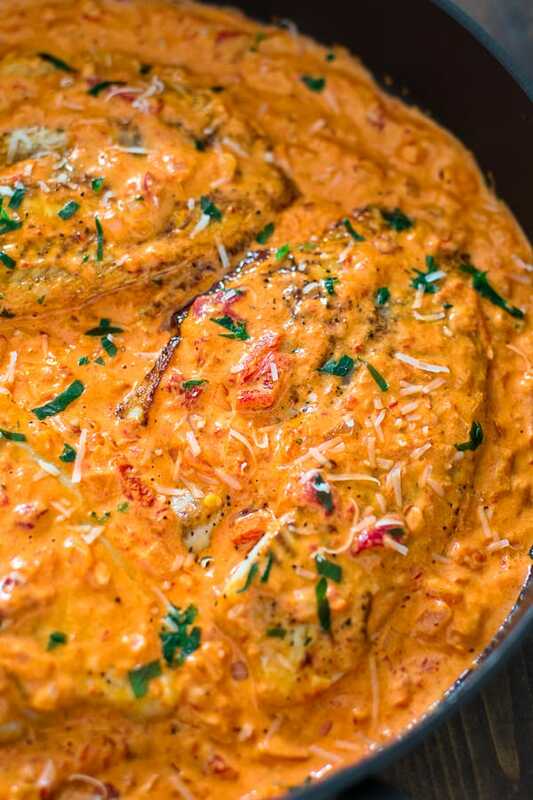 Thank you for such an easy and sophisticated sauce that I can’t wait to make again, either for the fish, shrimp or chicken. THANK YOU SO MUCH, KATHRYN! Comments like yours keep me going! Let me tell you how stupendous this sauce is!!! You could have it over pasta plain or with meat, seafood. You could slather it over an omelet for breakfast slopped up with biscuits. OK, how about just drinking it, or spreading it on your arms and licking it off!!! 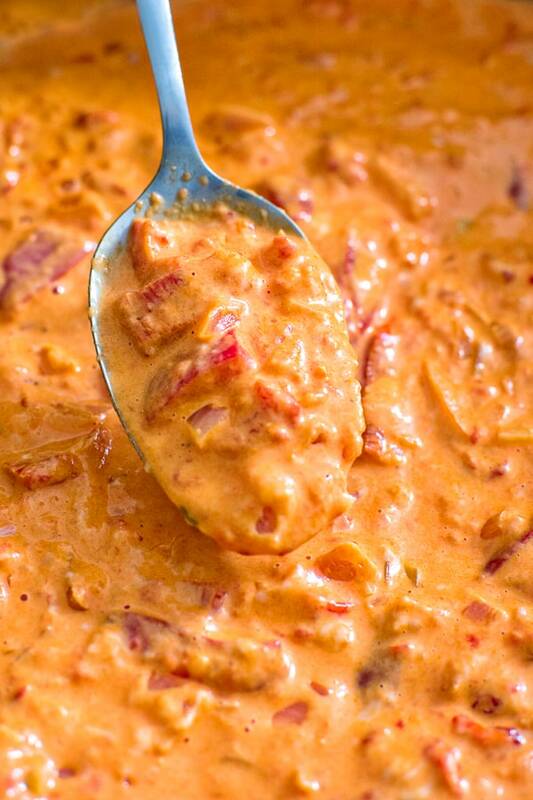 You are talking to the queen of sauces, and this hits it out of the ball park. I did make some changes on this version. I went to a wonderful Mexican restaurant in Chicago and had fish cooked with a red pepper sauce that was to die for. Therefore, in that vain, I added 1/2 t cumin, 1/2 t of smoked paprika, and 2t of ancho pepper ground. A few dashes of Franks of a bit of heat and vinegar brightness, and I could frame the recipe. I just want to thank you for this fabulous recipe. I might try it Italian, or Middle Eastern with different spices — or just like you published it on the blog. GREAT JOB!!! I love the spices you added, and I bet I was very tasty! Thank you for your feedback, my friend! Happy cooking! Oh my word, this was so good. I don’t really like fish but I try and incorporate it into our meals to make my husband happy. 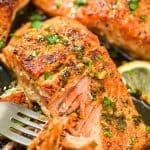 I would eat fish every night with this recipe. It is excellent and I will definitely be making it again. Thank you SO MUCH, Brenda! Comments like yours keep me going and make me cook more! Made this tonight and roasted my own peppers in the oven. Served it over cauliflower rice, and it turned out amazing. The whole family loved it! WOW! I am so happy to hear you enjoyed the fish, Levi! 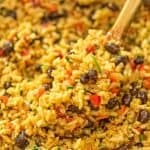 Love the cauliflower rice! THIS WAS AMAZING! I have never left a review on a recipe I’ve found on Pinterest but I just had to come on here and say WOW. The fish was nice and juicy, and the sauce has so much flavour! I can’t wait to make this again thank you so much! Can you use red peppers in oil for this? Hi Grover! Yes. Just remove the peppers from oil and blend into puree. Enjoy! Looks delicious! Just wondering what kind of side dishes you think would work well with this dish? Looking for something other than salad and/or bread please. This would go great with pasta, Misty! 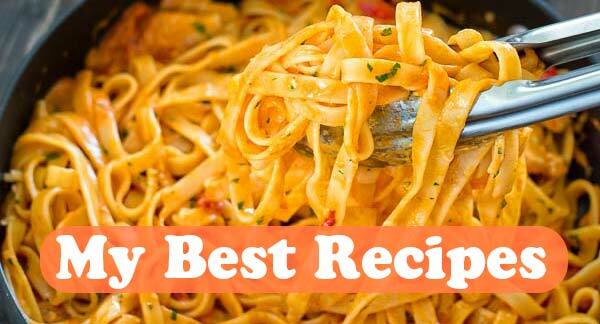 I would even recommend taking the fish out, throwing the hot pasta into the pan with the sauce and giving it a good stir. YUM! Of course, the classic white rice with butter would work well too. Thanks! Tania, im late to the posting…does recipe call for 12 oz total of roasted peppers or 6? Hi Yvonne! You’ll need 12 oz. of roasted peppers total. Half pureed and half chopped. Enjoy! This was so good! Perfect with garlic bread for the extra sauce, just as you wrote. 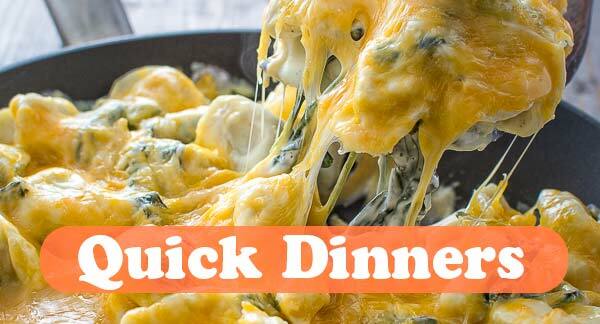 Thank you a wonderful weeknight dinner recipe. Thank you so much for sharing your feedback, Steve! I am really glad you enjoyed it! If I don’t use cheese it would be ok too? Hi Alegria! Yes, just use a little less cream. Enjoy! 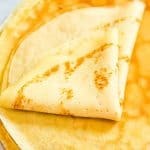 Would using a less fatty cream alternative (such as milk) change the substance of the sauce? Hi Amy! You can sub the cream with milk or coconut milk in this recipe. It will alter the texture a bit, but would still work. Thanks! 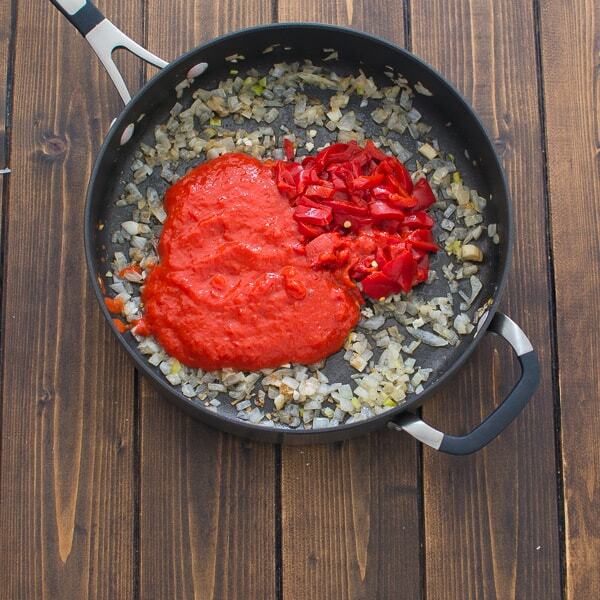 I’m going to making this as I love roasted red pepper sauce. Since so many commenters have asked about the roasted red peppers you might consider editing the recipe to say 6 oz “jar” of red peppers. Can’t wait to try as I have lots of fish in the freezer. Hi Nanci! I’ve added a note to the recipe. Thanks for catching this. 🙂 Did you try the fish? I cannot wait to hear how you liked it! 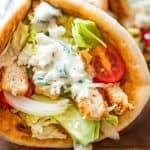 This recipe was delicious and so easy to make your own. Been trying to cut out red meet and chicken from my diet and this recipe made me feel great about that decision. Thank you! Excellent! I’ll be using this recipe again for sure. I absolutely loved this dish! 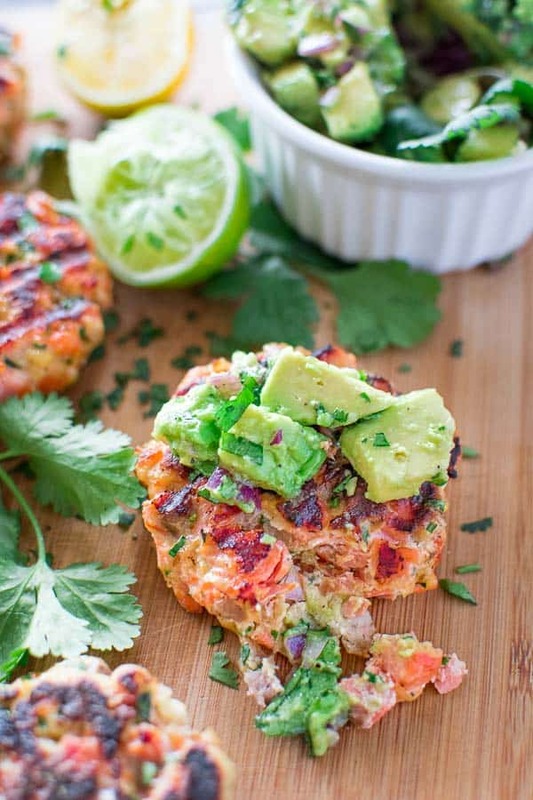 So easy to put together and absolutely delicious and flavorful. I made it last week and had some extra tilapia leftover so I’m totally making it again next week hehe! Hello Tania, I just want to know, are these roasted red bell peppers that come in the jar? Hi David! Yes, these are roasted red bell peppers from the jar. Thanks and happy cooking! Hi, sounds delicious. I’m wondering if you can use the roasted red peppers in a jar from the store. Hi Edna! That is exactly what I used. Happy cooking! 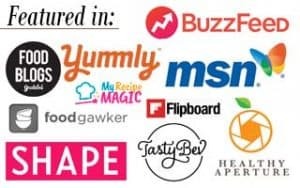 Where do you get puréed pepper? Or do you do it on your own? I just puree in in the bullet blender. Thanks! I wonder how it would work with poblano peppers? Were your just red bell peppers? Hi Janet! Poblano peppers have different taste and I don’t think they will work well for this recipe. I think it should work great with shrimp, Gina! Let us know if you give it a try. Enjoy! Hi Tania! Would love to try this recipe. However, I can’t get tilapia easily where I live. Do you think it would be still good with cod fillets? Yes. 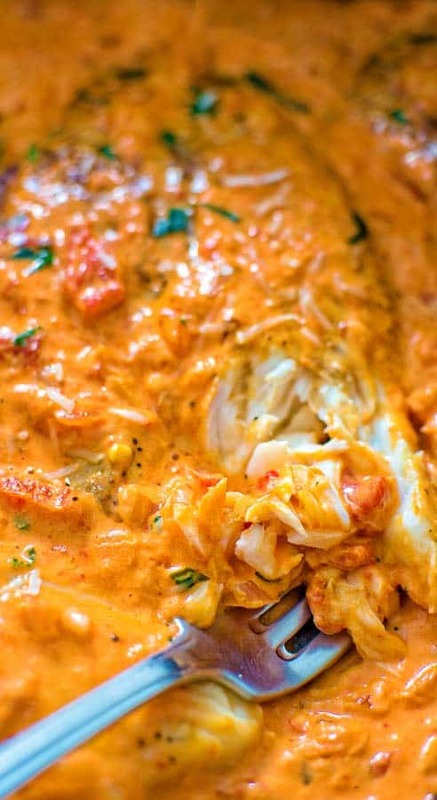 The sauce is THE BEST, and you’ll enjoy it with cod fillet, or even chicken. Do you think it will still taste good using full fat coconut milk instead of heavy cream? Thanks for posting, I am excited to make this regardless! Hi Sarah! I think it should taste great with coconut milk too, however, I’ve never tried it this way. Thanks! Thanks! I gave it a shot and it turned out wonderful! I bet it would be even better with real cream, but still a success. Thank you for the inspiration and direction! Canni use motsatela instead of parmesan cheese? Hi Melissa! 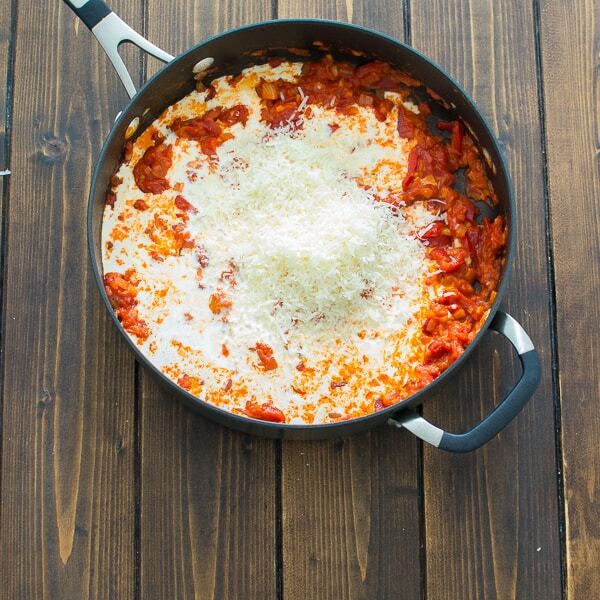 Mozzarella cheese will alter the texture and the flavor of the sauce dramatically. I wouldn’t recommend using it. 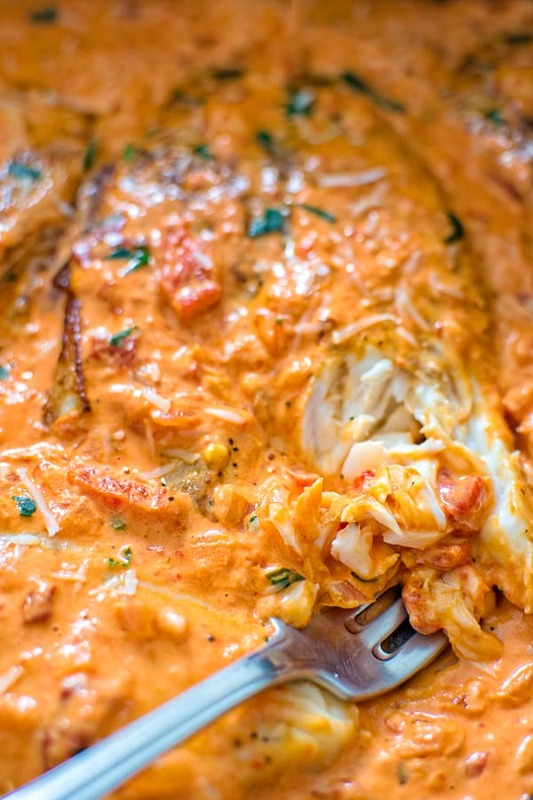 I made this last night….the sauce is so ridiculously good, my husband and I were eating it with a spoon after we devoured all the fish…I’ll definitely be making this sauce for pasta on it’s own, I can’t believe how good it was! !!!!! Thank you so much for sharing! !! What did you serve this with?? I served it over pasta, but it goes well with mashed potatoes or rice. Enjoy, Jeni! Thanks for sharing your feedback, Louise! I am happy you enjoyed it! 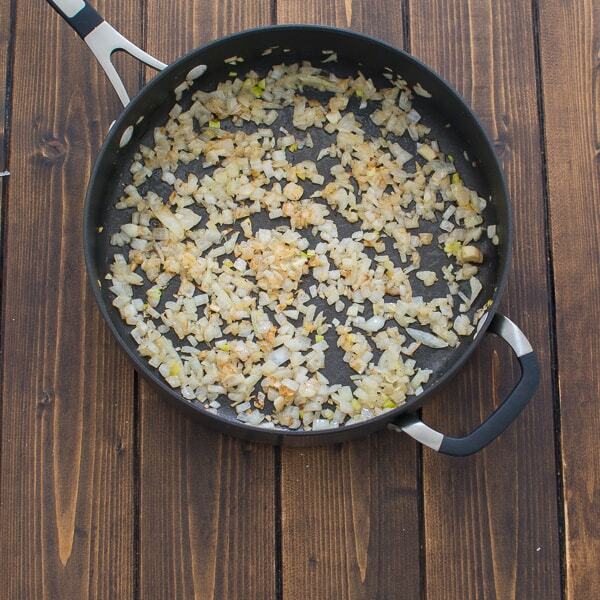 How high do you have the skillet when you are frying the fish? Hi Angela! I have been purchasing roasted peppers since my son was born, because I am constantly short on time. 🙂 Both home baked and store bought roasted peppers work well for the recipe. Thanks! Thank you for the reply, can’t wait to try this recipe this weekend!